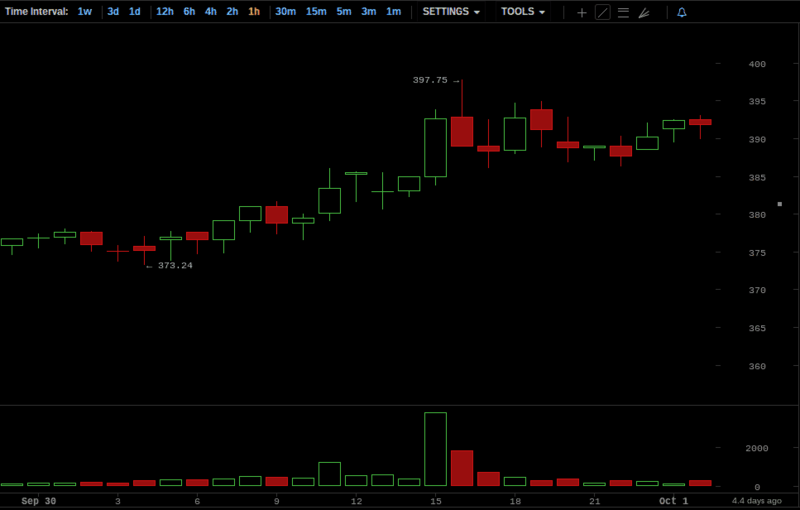 This is the Coin Brief weekly Bitcoin price report for the week of September 28, 2014-October 4, 2014. This week was was extremely bearish for the Bitcoin markets. Overall, throughout the duration of the week, the price fell by 16.67%. Sunday, September 28, began at $402 — well within the $390s to $400s Bitcoin price range that persisted throughout most of last week. However, that trend would not continue into this week; the price began falling around 7 AM. By the bottom of the noon hour, the price was at $388. 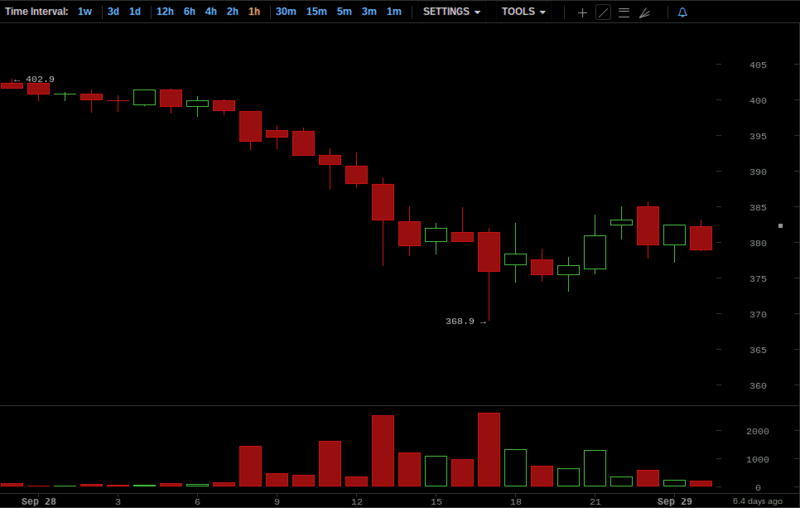 At the top of 5 PM, the price was at $381 and experienced an hourly low of $368.90. The first day of the week ended at $379. The 29th opened at a 5.72% loss from the start of the previous day, with the Bitcoin price at $379. While the activity on 28th was decidedly downward, the market had no concrete pattern on the 29th. 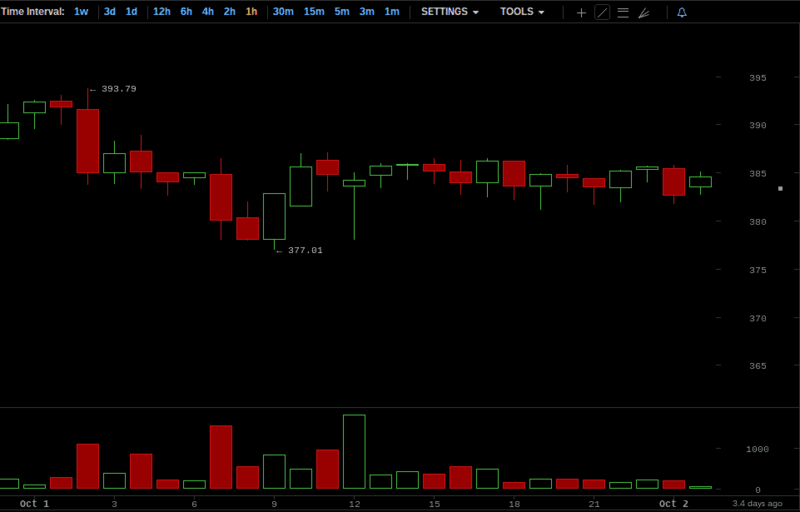 At 2 AM, the price fell from $380 at the top of the hour to $365 by the close. The price then began to rebound from this drop, and had climbed to $384 by the bottom of the noon hour — having an hourly peak of $386.03. The Bitcoin price slipped into the $370s during the latter half of the day, finally closing out at $377. Tuesday began at $377, a slight decline of 0.52% from the opening price on the 29th. This day saw steady gains in the market, with the Bitcoin price climbing throughout the duration of the day. By the end of the noon hour the price had hit $385, and by the top of 4 PM it had reached $393, with an hourly high of $397.75. The price remained fairly stable for the rest of the day, closing at $391. The first day of October started out at $391, a substantial 3.71% increase from the start of the previous day. 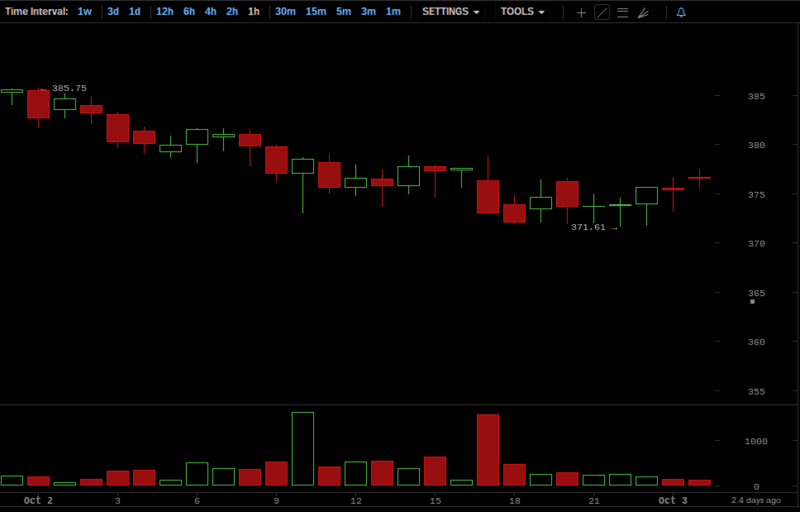 The Bitcoin price fell slightly in the morning hours and then remained level for the rest of the day. At the open of the 9 AM hour, the price was at a daily low of $378; by noon, the price had returned to the $380s, where it would stay for the rest of the day. October 1st ended at $385. The 2nd opened at $385, down 1.53% from the open of the 1st. 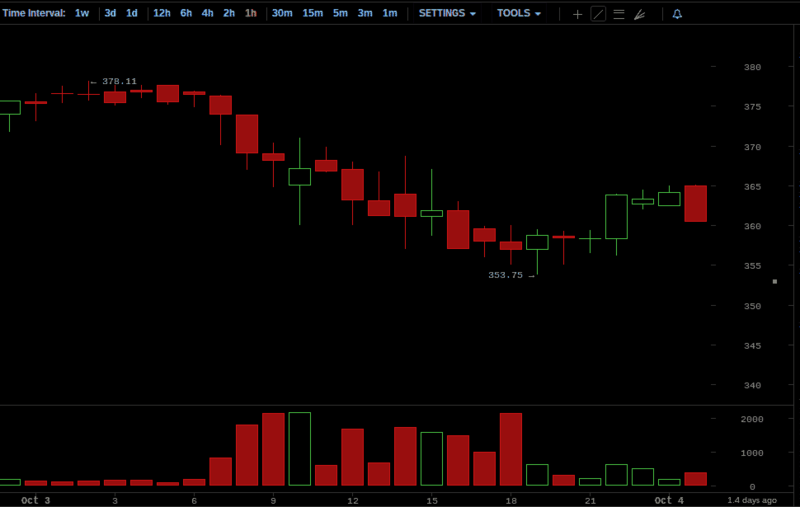 The Bitcoin price fell very slightly for the entire day; by the end of the noon hour, the price was at $377. 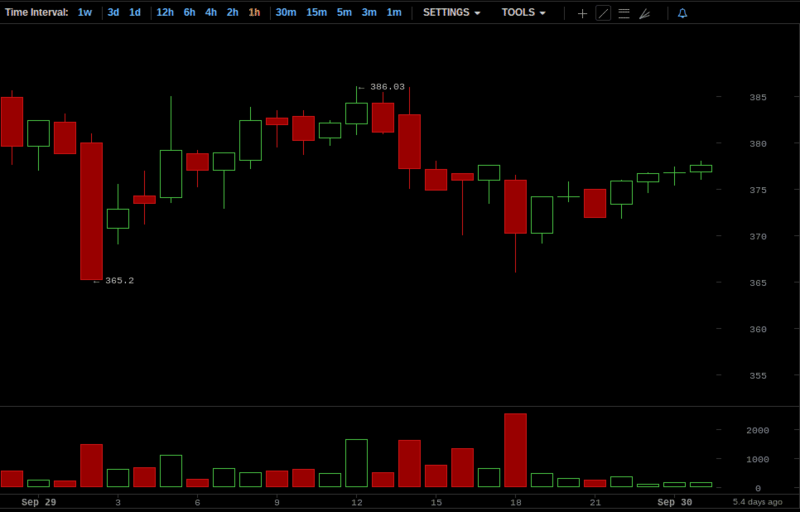 By the bottom of 5 PM, the price had hit $373. The day closed at $376. Friday, October 3, began at $376, a 2.34% decline from the start of the 2nd. This day was another day of steady Bitcoin price decline, though it was a more accelerated decline than the one we saw on the previous day. The price fell into the $360s at 9 AM, and went down into the $350s at 5 PM. There was a small rebound from the fall into the $350s, though, and the day closed at $362. Our final day of the week opened at $362 — down 3.72% from the start of the previous day. On this day, the downward momentum on the Bitcoin price accelerated to an even faster pace. By the bottom of the noon hour, the price had fallen to $337, with an hourly low of approximately $325. At some point during the 4 PM hour, we saw a daily low of $322.04. Our week ended at the close of October 4, with the price at $335 — a 7.46% drop from the beginning of the day. Last week, we gave two possibilities for our ceteris paribus forecast. The first possibility stated that the Bitcoin price would continue the sideways pattern that persisted for most of last week. 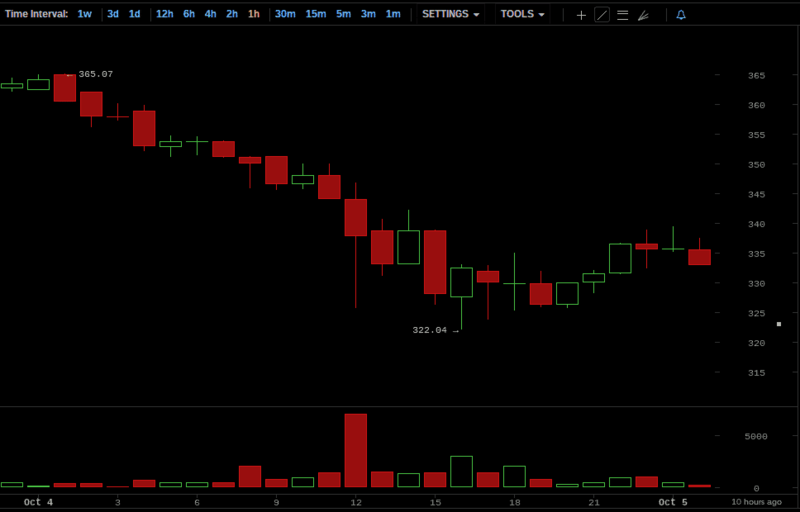 Secondly, we predicted that the price would continue falling below $390. The latter prediction ended up being the correct one, as the price fell far below the $390 point. Overall, this week saw a 16.67% drop in the Bitcoin price. As for the coming week, our forecast is very straightforward. Given the activity of this past week — especially the accelerated decline that occurred towards the end of the week — we must say that, ceteris paribus, the Bitcoin price will continue falling. We cannot say, however, how fast the price will fall or when it will stop falling. Such specific information is impossible to predict, regardless of the analytical tools that are employed. All we can say with confidence is that the price will stop falling when it goes low enough to spur buying and discourage selling, bringing the market closer to equilibrium.